Making these were a snap but because of dry times, it takes just a bit of time. Using mod podge, brush 2-3 coats onto the pointed tip of the Make It Fun egg, (this allows styrofoam to be painted.) Allow to dry according completely. Using pliers, remove all but the top part of a pinecone until it resembles an acorn top. Cut the Make It Fun egg in half; keep the pointed end that is coated with the mod podge. 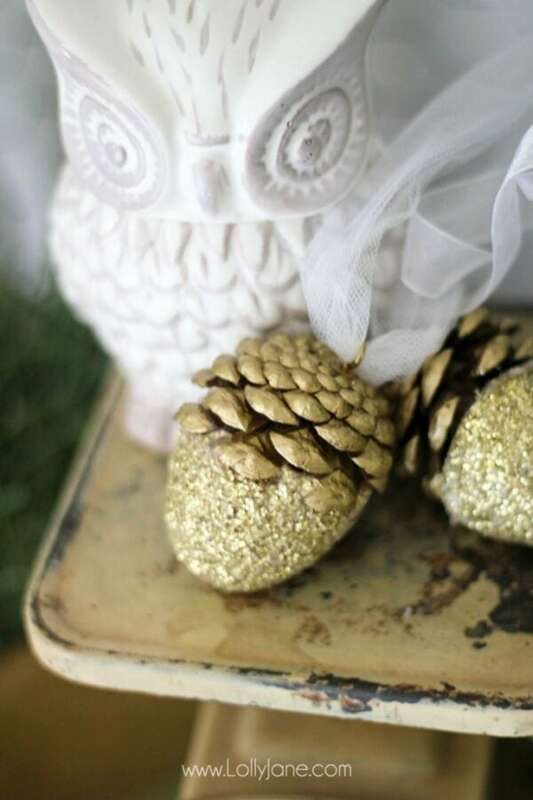 Paint the pinecone with a thin coat of liquid gilding. 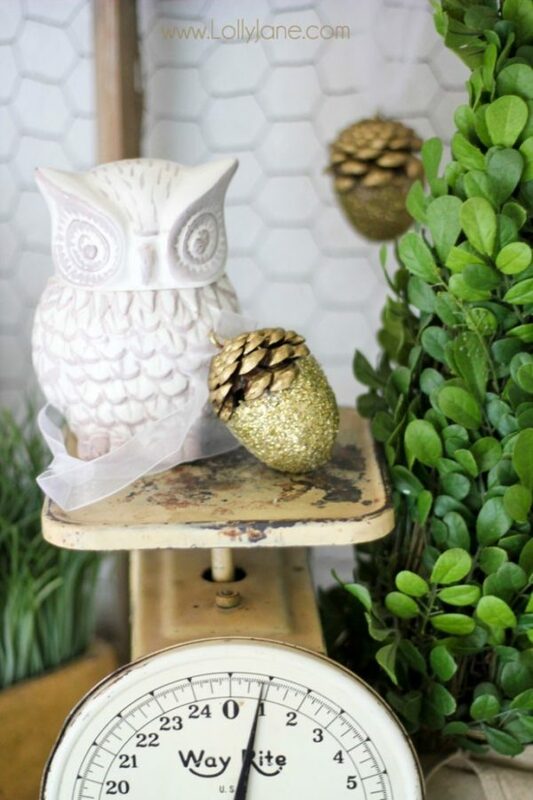 Paint the Make It Fun egg in a gold glitter paint. 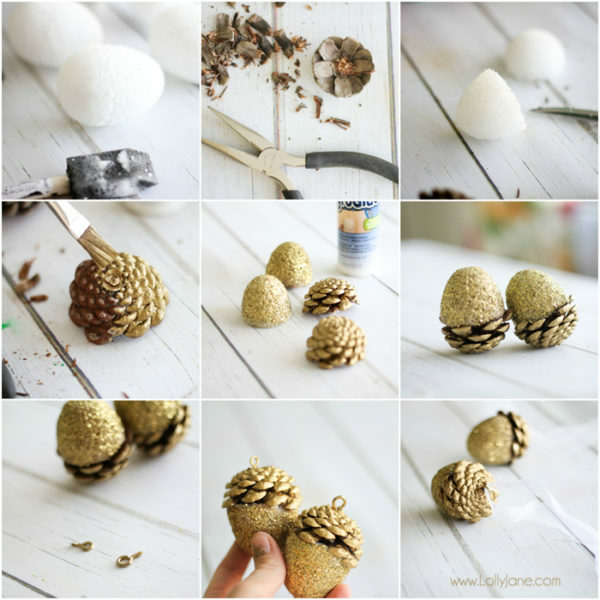 Glue the pinecone + Make It Fun egg together using StyroGlue styrofoam glue adhesive. Using 2 small gold eye hooks, screw into the top of the acorns. String with ribbon and hang! Aren’t they cute paired with Kelli’s clay deer head ornaments??? Love! There you have it, a simple Christmas acorn ornament with little effort! 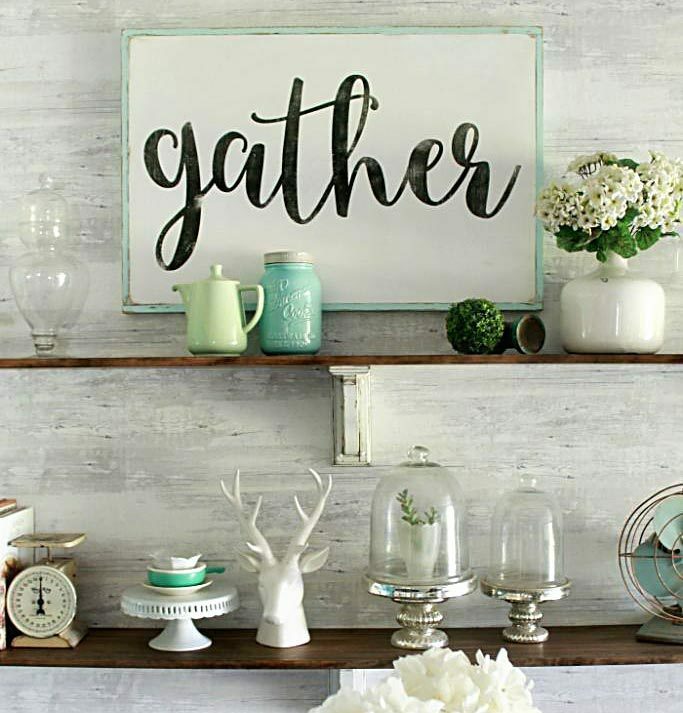 These would also be adorable tied on top of a gift or as a bunch in hurricane lamp or scattered around your Christmas mantle. What a brilliant idea! 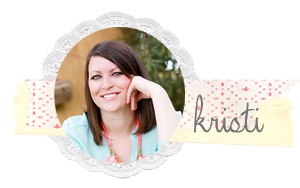 Thanks for sharing and inspiring! These are just amazing!! They look pretty simple as well. I think I am going to go to the store Monday and get the supplies. These look too easy and pretty to pass up. Thanks for sharing! I love this so much! 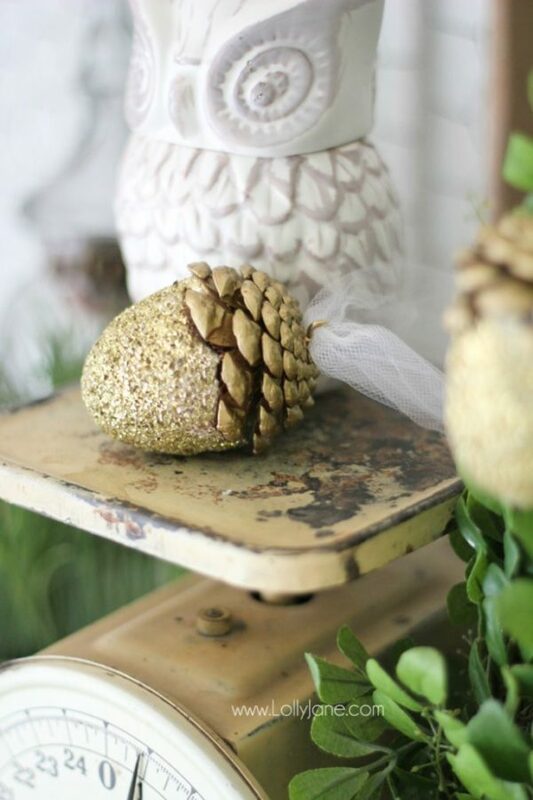 I need to find some pinecones and make this! These are so pretty! 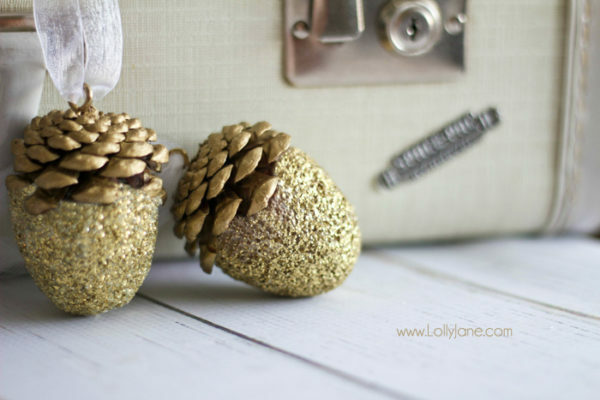 I love the sparkle, and you’re right, there are so many ways to use these pretty, sparkly acorns. Thanks for the tutorial! These are absolutely gorgeous! I would love to have a tree FILLED with these. How cute!! 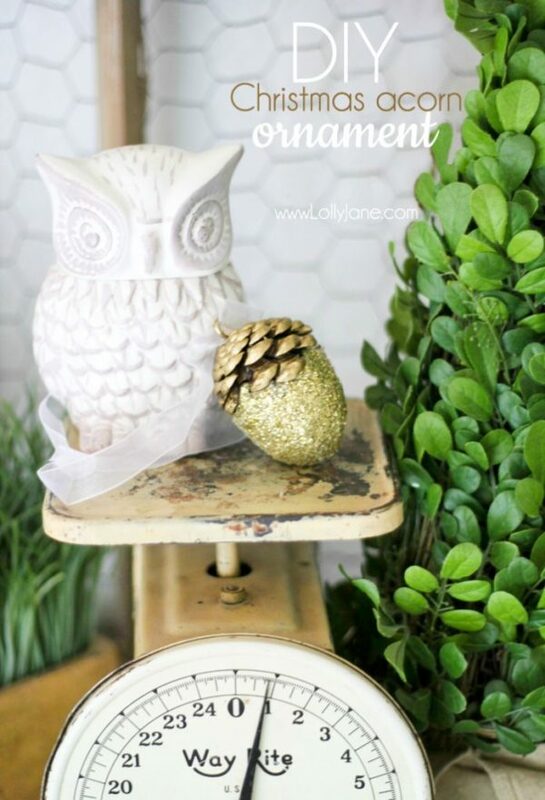 I love nature inspired decor at Christmas! 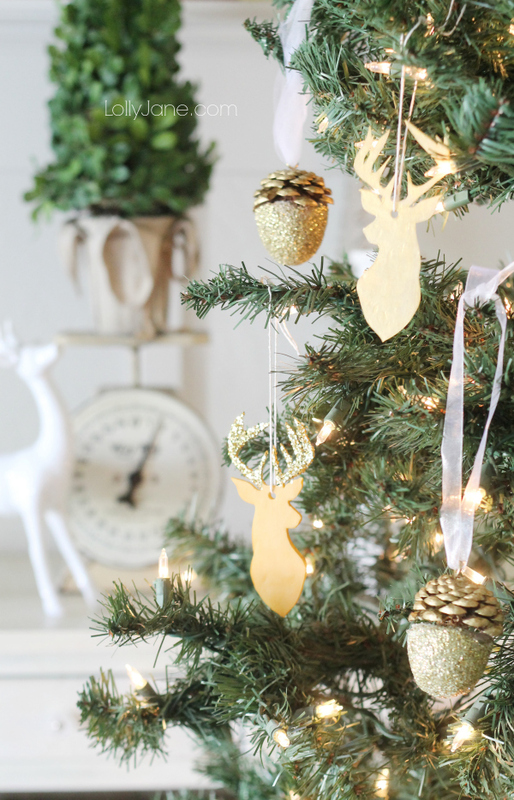 Great Handmade Christmas Ornaments you can make today- this is an awesome collection of handmade ornaments that are easy and inexpensive to make!